348 yearlings were sold for $11,731,772 during the inaugural Summer Book of the Inglis Sydney Classic Yearling Sale at Newmarket over the past two days. 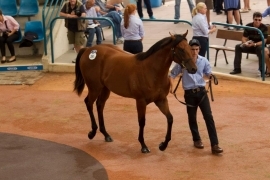 “Buyers were quite selective early on today, but the sale really picked up in the afternoon, with considerable growth in the median a result of real strength in the $30,000 to $60,000 price range,” said Inglis Bloodstock Director Jonathan D’Arcy. Last year’s top price of $140,000 was eclipsed twice on Monday. Lot 261 Bell River Thoroughbreds’ colt by Not A Single Doubt from Fleecing was sold to leading Perth trainer Neville Parnham early in the day for $170,000 and that figure was also obtained two hours later when Fairview Park Stud’s colt by Magic Albert from Kianben was sold to local trainer David Vandyke as Lot 332. Mr Tomohiro Sekiguchi, the owner of Saturday’s $250,000 Inglis Classic race winner Marseille Roulette, was back purchasing at the sale today. The Japan based businessman purchased Lot 439, Sebring-Private filly, for $140,000 from Turangga Farm, which were the vendor of Marseille Roulette at the Classic Sale twelve months ago. Singapore trainer Theo Kieser has a growing reputation as an astute preparer of two-year-old winners and the Kranji based conditioner was on hand in Sydney to snap up Lot 438, a colt by Magic Albert from Prinny’s Girl, for $105,000 from the draft of Fairview Park Stud. “There was a real diverse buying bench assembled here this week, with Western Australia, Korea, New Zealand, Japan, Singapore and the local contingent all investing in a great selection of yearlings,” said Inglis Managing Director Mark Webster. “Syndicators such as Triple Crown have been great supporters of the Classic Sale and I recommend to anyone interested in getting into racehorse ownership to jump onto the Inglis Sharemarket in the coming weeks to view what shares are available. “The clearance rate from Day One has risen to 83% and with our Make-An-Offer system in full swing I anticipate the overall sale to push past 80% as private sales filter in over the comings days,” Webster added. Horses passed in during the last two days are available for sale via the Inglis Make-An-Offer Service. Focus now moves to the Inglis Melbourne Premier Yearling Sale which will be conducted at Oaklands on March 3 to 6.